The Nestle Boost Breeze Supplement Orange Flavor 8oz Brik Pak Each, Model #18620000, is anchored in advanced science and research. Nestle Healthcare Nutrition offers nutritional solutions for people with specific dietary needs related to illness, disease states or the special challenges of different life stages. 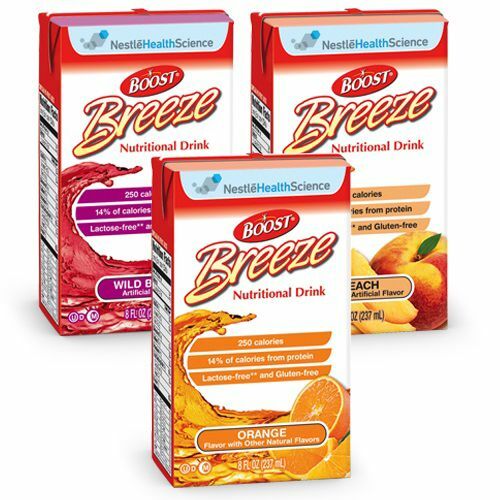 The Nestle Boost Breeze Supplement Orange Flavor 8oz Brik Pak Each is a convenient source of additional protein and calories in a fruit-flavored drink. One 8 fl oz serving of this fruit flavored, clear-liquid nutritional drink provides 250 calories and 9 grams of high quality protein. Ingredients: WATER, SUGAR, CORN SYRUP, WHEY PROTEIN ISOLATE (MILK), AND LESS THAN 1% OF PHOSPHORIC ACID, CITRIC ACID, L-CYSTEINE, ASCORBIC ACID, VEGETABLE JUICE AND BETA-CAROTENE (COLOR), ALPHA-TOCOPHERYL ACETATE, ZINC SULFATE, NATURAL FLAVOR, FERROUS SULFATE, NIACINAMIDE, VITAMIN A PALMITATE, CALCIUM PANTOTHENATE, COPPER GLUCONATE, MANGANESE SULFATE, VITAMIN D3, PYRIDOXINE HYDROCHLORIDE, THIAMINE HYDROCHLORIDE, RIBOFLAVIN, FOLIC ACID, BIOTIN, POTASSIUM IODIDE, PHYTONADIONE, VITAMIN B12.